From SA node, impulses travel through three internodal tracts, namely anterior, middle and posterior before reaching the AV node. Excitation in atria spreads in a circular fashion. The right atrial excitation occurs earlier than the left atrium. Atrial excitation is completed in 0. 1 sec. The conduction velocity in the SA node is 0.05 m/sec. Atrioventricular node is present at the right posterior interatrial septum. The AV node is also like SA node, which shows slower conduction. The velocity of conduction in the AV node is also 0.05 meters/sec and both the SA and AV node are called slow fibers. The delayed conduction in the AV node is called nodal delay. It lasts for 0.1 sec. This ensures completion of ventricular filling. The delay is shortened by stimulation of sympathetic nerve and lengthened by vagal stimulation. 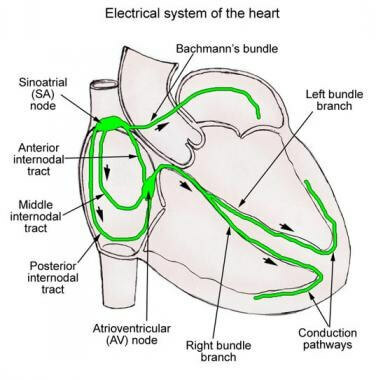 The AV node gives rise to bundle of His, which has right and left bundle branches. They proceed on each side of the interventricular septum to their respective ventricles. The bundle of His shows conduction velocity of 1 meter/sec. If there is a conduction block in any one of the branches, the depolarization of the ventricle on that side of the block is delayed. The branches of bundle of His end in the Purkinje fibers which are fast fibers. The conduction velocity in this tissue is high. It is 4 meters/sec. It arborizes extensively in the ventricular myocardium. The ventricular myocardium shows excitation of endocardium first and then epicardium. The depolarization of the ventricle starts with the excitation spreading from left to right, in the interventricular septum. The excitation now spreads to the apex of the interventricular septum. From the apex of the septum, excitation moves to the ventricular wall, spreading from endocardium to epicardium. The depolarization now reaches the AV groove and the regions to be excited last are, posterobasal portion of left ventricle, pulmonary conus and upper part of the septum.